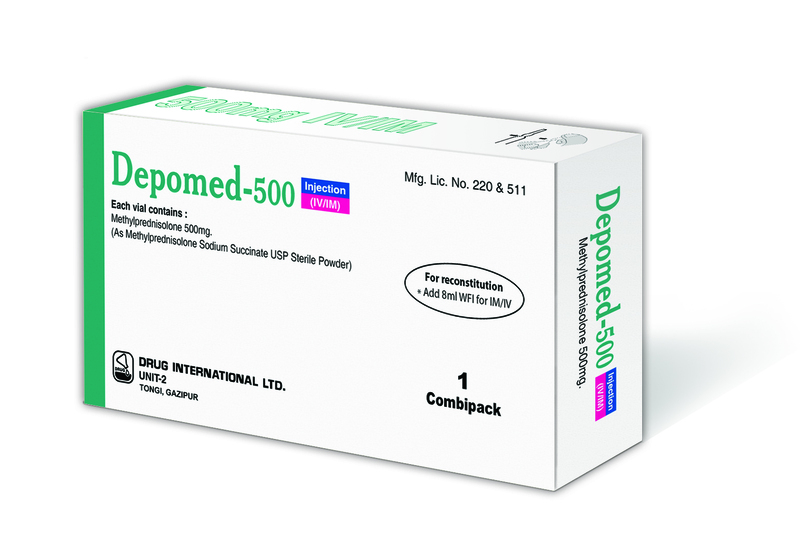 Composition : Depomed 500mg IV/IM Injection : Each vial contains sterile powder of Methylprednisolone 500mg as Methylprednisolone Sodium Succinate USP IV/IM Injection. without uremia, of the indiopathic type or that due to lupus erythematosus 11. Gastrointestinal Diseases: Ulcerative colitis, regional enteritis 12. Nervous System: Acute exacerbations of multiple sclerosis, etc. It is also indicated for the treatment of terminal cancer, organ transplantation, cardiovascular condition etc. Administer 30 mg/kg IV over a period of at least 30 minutes. Dose may be repeated every 4 to 6 hours for up to 48 hours. Initially 2-3mg/kg/day IV, decreasing after 7 days. therapy (or during exacerbation episodes). improvement has not occurred within a week after therapy. 1 g/day for 1 to 4 days, or 1 g/month for 6 months. to standard therapy (or during exacerbation episodes). repeated if improvement has not occurred within a week after therapy, or as the patient's condition dictates. Treatment should begin within 8 hours of injury. continuous infusion of 5.4 mg/kg/hour for 23 hours. continuous infusion of 5.4 mg/kg/hour for 47 hours. There should be a separate intravenous site for the infusion pump. mg/kg every other day for 4 days or 1 g/day for 3, 5 or 7 days. intervals dictated by the patients response and clinical conditions. Dosage may be reduced for infants and children but should be governed more by the severity of the condition and response of the patient than by age or size. It should not be less than 0.5mg/kg every 24 hours. Dosage must be decreased or discontinued gradually when the drug has been administered for more than a few days. Or, as directed by the registered physicians. Use in Pregnancy & Lactation : Pregnancy Category C. There are no adequate and well-controlled studies in pregnant women. It should be used during pregnancy only if the potential benefit justifies the potential risk to the fetus. It is not known whether this medicine is excreted in human milk. Caution should be exercised when this medicine is administered to a nursing woman. Packing : Depomed 500mg IV/IM Injection : Each Combipack contains 1 vial of Methylprednisolone 500mg as Methylprednisolone Sodium Succinate USP sterile powder with 1 ampoule of 10 ml water for injection USP.